Over the years the Diseased Sons ranks have swelled. Starting out merely as allies to my original army and made up of figs that I'd gotten with the box set or from friends, to a force worthy of it's own webpage. After counting all the buggers I've painted, and it's only worth counting the painted models, I decided what I really needed was a picture of the entire force arrayed. So I cleaned off my table and unpacked every last one. With the new Plague Marines not yet released and the old ones being in scarce supply as well I decided that I might even strip a few out of print models, knowing I could give them a better paint job at my leisure. Though I have plans to convert and paint some more models, I'm not sure when I'll get them done. 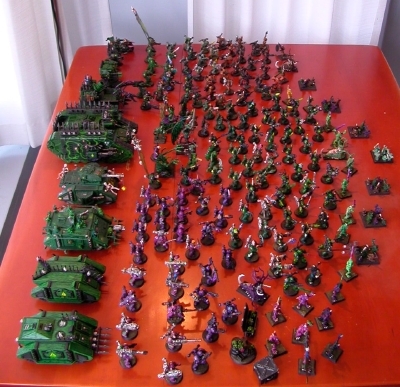 So, as of April 4th 2003, this is the entire compliment of the Diseased Sons, Nurgle Space Marine force. The stripping and repainting of old cool models has begun. Some of the models will not be painted in Nurgle colors when all is said and done, they will likely end up as Undivided troops so I can make use of the heavy weapon models on the table top. I will also likely do up some bikes or obliterators or raptors at some distant point in the future, as this has always been forbidden to Nurgle. I still am only working on Nurgle though and 21 of the better painted Plague Marines are viewable closer up in a gallery now. Most of these models were in the pictures on this page, but some are completely new. I'm hesitant to recount and re-photograph the entire army due to it being in a transitional state. I'm also extremely busy with doing my MBA though I'm currently on winter vacation. For those who would like a little more detail click on the images or try these close ups of: the left, the center, and the right. With my Nurgle 3.0 Grand Tournament army basically converted and painted, and with time on my hands due to an extend period of unemployment, I finally stripped or touched up all my old models. The ones that were ugliest and most models armed with a heavy weapon are no longer Diseased Sons, they are bitz box fodder or awaiting a new paint job. In addition to adding models specifically for my GT army, I also started painting and converting enough Icon Bearers and intelligently armed aspiring champions so that no squad will be without. When I get the last dozen or so Diseased Sons done, plus finish touching up my remaining non-tiny line models I will have to take a few hours and carefully set them all up and retake this photo. The compliment for the entire army has changed. I have another painted dreadnought, more plaguebearers, but given all the stripping I've done I probably have less Plague Marines but maybe more Terminators. Plague Terminators is a prominent feature of my third GT army, because I wanted guns that shoot over 24 inches. If some of the new codex rumours or true I may be able to have them a lot easier in the future, I'm tired of painting tiny lines, or just tired of the status quo period. I think my new paint scheme as seen on some Night Goblins and the Phantom of the Rock Opera will be cool but hopefully a little quicker to paint. I got to do less trim and finicky work on my rank and file. That seems to be the key to a quicker painted army that and a limited palette and less highlights and conversions. I keep updating my web empire when I should be applying for jobs. I badly need a new full time job. I've been unemployed way too much since I got the bright idea of doing my MBA at the Sauder School of Business. This website is maintained by hand and is 100s of pages big in all likelihood. I don't even remember some things I've made available online, but one thing I did do during this period of unemployment which will be of interest to people who have read down this far, is take a video tour of the painted miniatures in my three Ikea display cabinets. I still have more painted minis not on display but not many. The first display is basically all Diseased Sons with the last case devoted to my original Rogue Trader era Ork army which will get dusted off and updated one of these days, but I'm not stripping and repainting a third of the models, that is for the birds, especially with 100s of unpainted plastics and eBay usually having OOP unpainted models. The tour was put up on my new and not very active right now, Miniature Painting Blog, but the video is on YouTube so I can include it inline.